November | 2012 | What's Cooking at the Genua's? 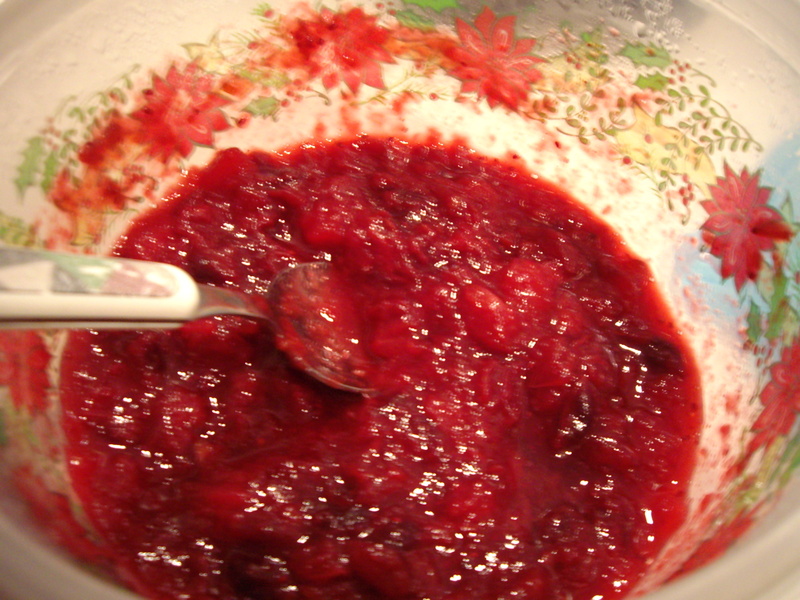 I was never one to eat the canned, gelatinous cranberry sauce. Thought it was nasty. Still do actually. Especially with all that sugar in it!! So I searched my recipes and came up with a combination of a few. It’s very simple, really. I had bought a few bags of fresh cranberries before Thanksgiving because they were on sale and couldn’t pass up the BOGO special. I have another bag left and I think I’ll make another batch to freeze. Last night I made my Thanksgiving Bundles and we had no sauce so I made this recipe. So easy and so tasty! 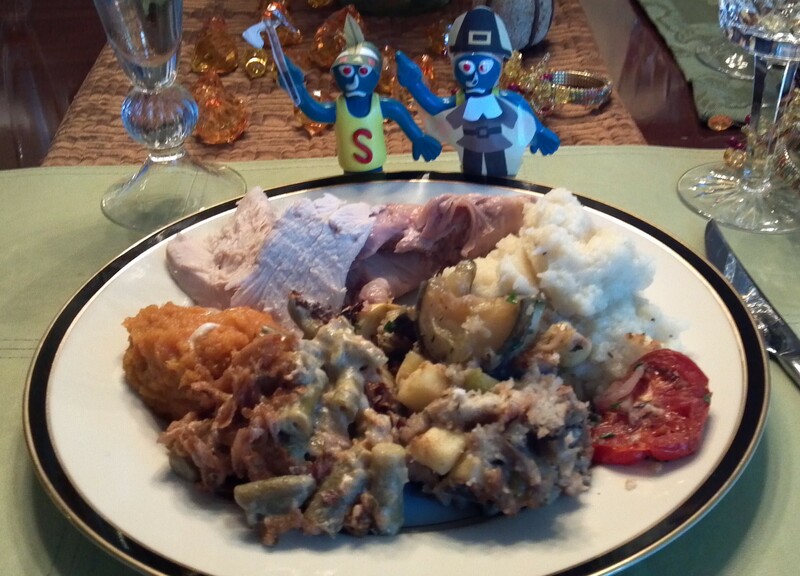 Oh and revisit my Thanksgiving Bundles post as I updated the photos. Add the water and Splenda to a medium pot. Bring to a boil. Add the cranberries and orange zest. Stir and bring to a boil again. Lower heat to simmer and add the apple and cinnamon stick. Simmer, covered, for 10-15 minutes stirring occasionally. Remove the cinnamon stick. I used a potato masher and just broke up some of the cranberries and apple pieces but you don’t have to do this. Remove from heat and cool. Chill a few hours before using, unless you like it warm! That’s it! Simple. Just be careful when the cranberries start to pop. The splatter can be hot! Anyone still hungry? Believe it or not, even after eating much more than normally yesterday, I woke up starving! Go figure! I hope everyone had a wonderful and thankful Thanksgiving yesterday! I am sure thankful for the wonderful family and friends we have. This Thanksgiving was spent with our wonderful friends Debbie & Bruce and their handsome bulldog Hudson. This was our 3rd Thanksgiving with them and as always there was lots of laughter, food and booze. Good friends are hard to find these days so when you are lucky enough to find some, hang on to them. We are so thankful we did! This year was a small group, only 5 of us, but you’d think we were feeding 10-15 with the amount of food! I guess we don’t know how to cook for a small group. Oh well, leftovers! Even though we didn’t cook at our own house we got leftovers to go. BUT if you did cook at your house and you have lots and lots of leftovers today’s recipe will give another option of what you can do with them. I actually always buy a turkey this time of year, you can’t beat the sale price (.59 lb)! I keep it in the freezer till July and then we have a summer Thanksgiving. And this recipe came about from my summer Thanksgiving. I am going to call it Thanksgiving Bundles. 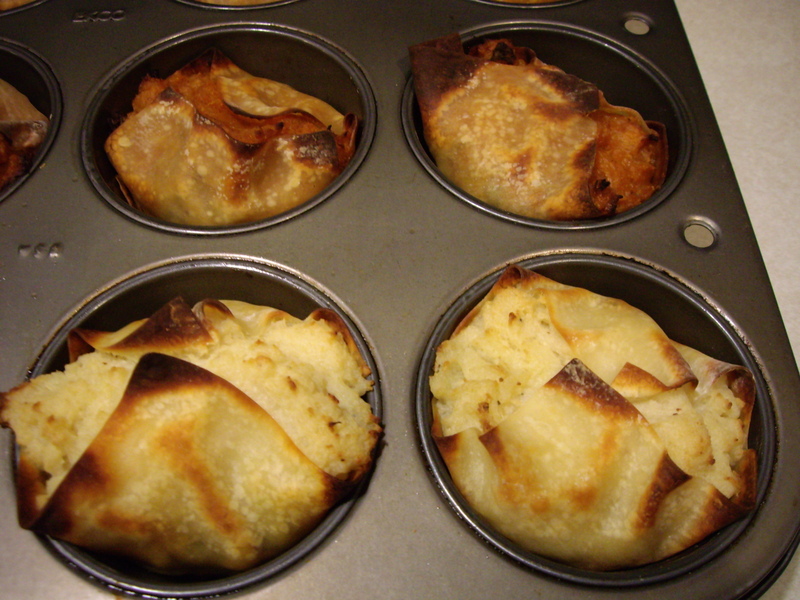 It is a cross between a pot pie, a mini calzone or some kind of pierogi. Not sure exactly how to describe it. 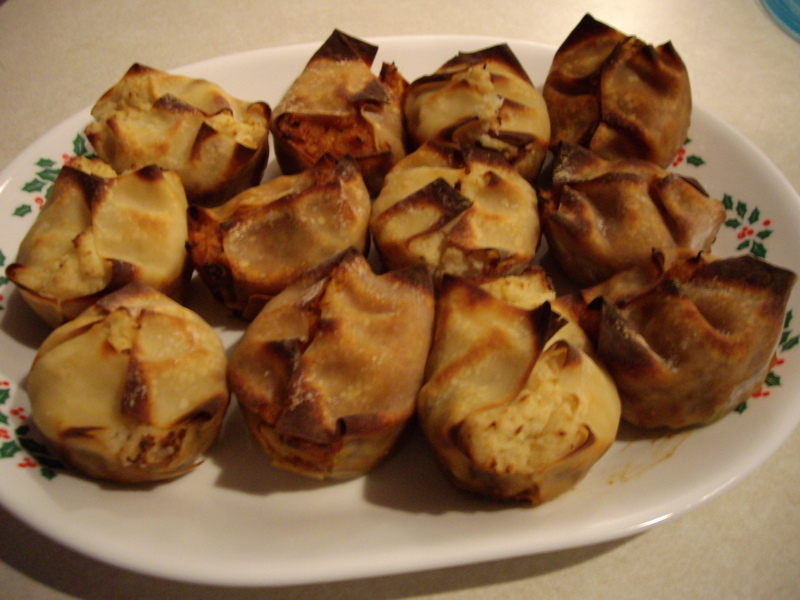 But those of you who follow my blog know I have become obsessed with the wonton wrappers. 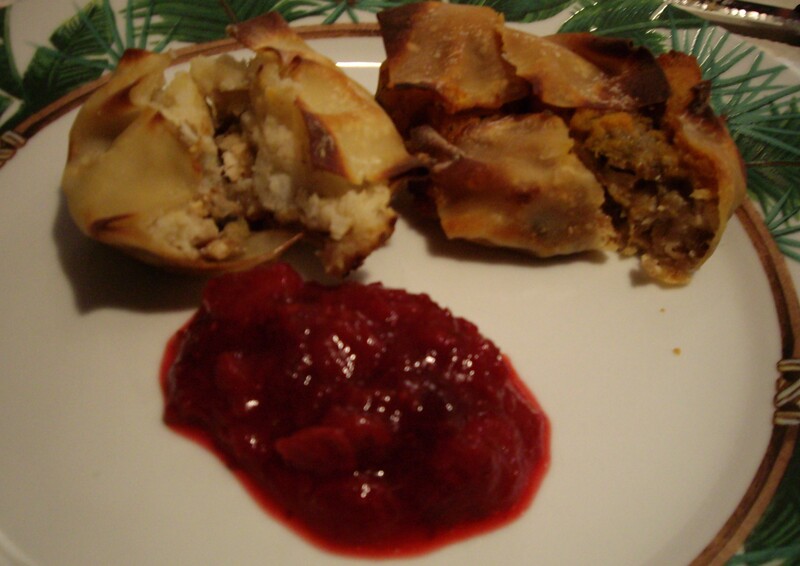 Soooo I came up with a stuffed wonton ala Thanksgiving. 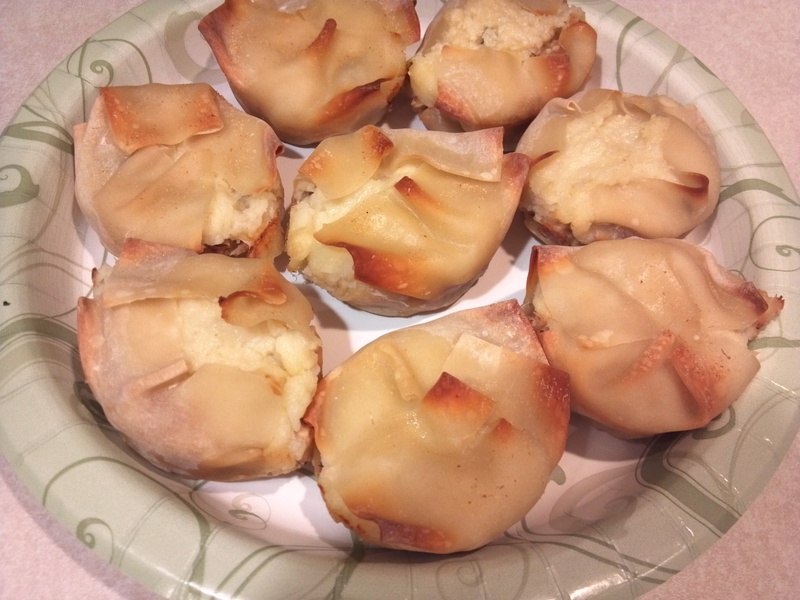 Though for this recipe I am not using the mini muffin tin. Too small. I used the regular muffin tin but then realized one of the mini wrappers was way too small so I used two wrappers per muffin cup. I just had them half in half out, with enough of the wrapper sticking over the sides so you can fold them over the top when you’re done stuffing! Came out incredible! There is no real “recipe” for this. You can add whatever you want to your own bundles. But when I made them I had turkey, stuffing, gravy and my Smashed Cauliflower recipe. I didn’t have cranberry sauce but if I did I would have had it on the side. Chop up the turkey into small pieces or shred. Chop up any large veggies into small pieces. Mix the turkey and veggies with the stuffing. Add some gravy to the mixture to keep it moist. Mix well. 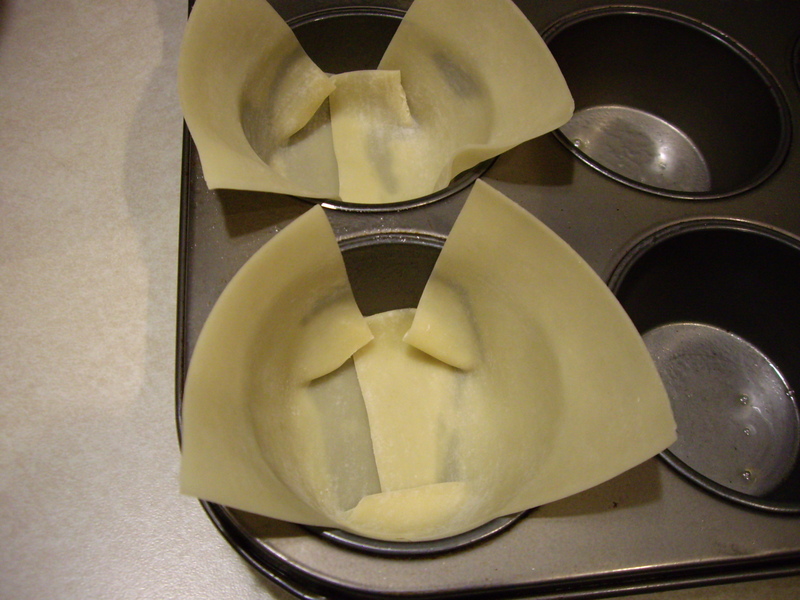 In a regular muffin tin, lay two small wonton wrappers so half is in the tin and half hanging over the edge. Fill the tin with the turkey mixture about 3/4 way full. Press down. 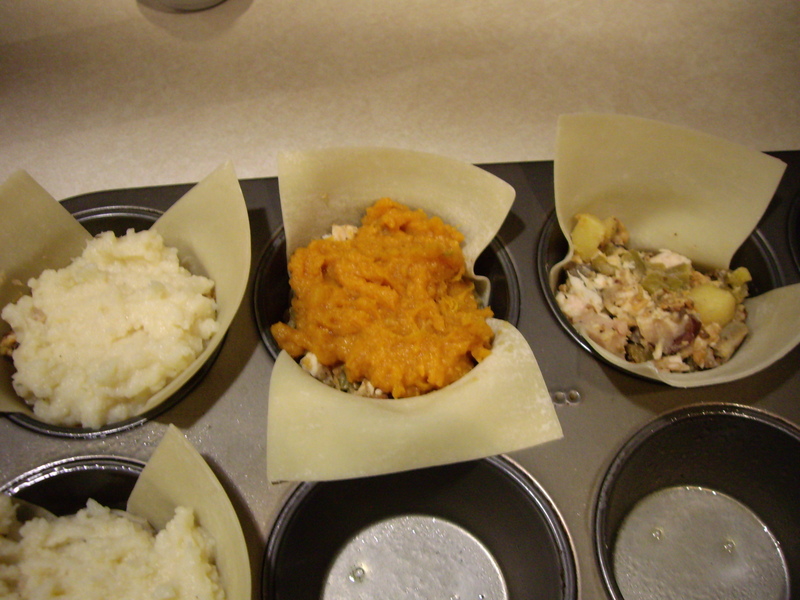 Then on top of that place either mashed potatoes or mashed sweet potatoes. 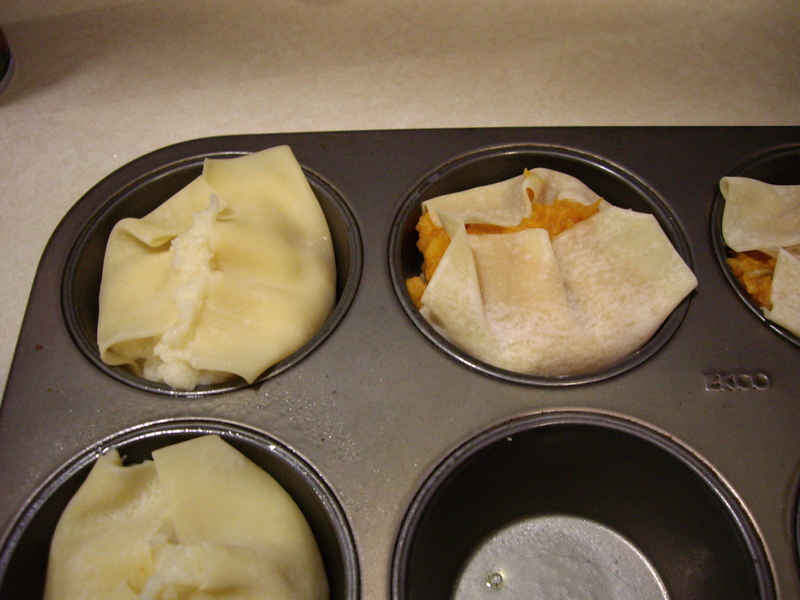 Fold the flaps over (don’t worry if they don’t fold perfectly) and spray a little cooking spray on top. Bake at 350°F for about 10-15 minutes so everything is heated through. Serve with cranberry sauce and extra gravy on the side!